We’d love your help. Let us know what’s wrong with this preview of Island Fog by John Vanderslice. Island Fog is a collection of linked short fictions by veteran storyteller John Vanderslice. The eleven stories of Island Fog are connected by both geography and theme. Every story is set on Nantucket Island, Massachusetts, and together they span a period of Nantucket history from 1795 to 2005, with four different centuries represented. Some of the characters the reader me Island Fog is a collection of linked short fictions by veteran storyteller John Vanderslice. The eleven stories of Island Fog are connected by both geography and theme. Every story is set on Nantucket Island, Massachusetts, and together they span a period of Nantucket history from 1795 to 2005, with four different centuries represented. Some of the characters the reader meets along the way include an 18th century wigmaker accused of a notorious bank robbery, a 19th century "whaling widow" who has newly awakened to important aspects of her sexual nature, a former whale ship captain who once had to resort to cannibalism to survive an extended period at sea, a 20th century plumber whose wife jumped off the Hyannis to Nantucket ferry with her infant child in her arms, and a 21st century ghost tour leader who is being metaphorically haunted by a former lover. To ask other readers questions about Island Fog, please sign up. I'm become very leery in the last few months at taking on works from a press I've never heard of, but in this case it was a gamble won. More than anything, I loved the disturbing tone of these tales that often (especially in the last story, "Island Fog") move into the realm of the strange; the historical aspect of this collection also appealed to me in a big way. It's definitely a book that will stay with me for a very long while. There are eleven stories in this book that are united by the virt I'm become very leery in the last few months at taking on works from a press I've never heard of, but in this case it was a gamble won. More than anything, I loved the disturbing tone of these tales that often (especially in the last story, "Island Fog") move into the realm of the strange; the historical aspect of this collection also appealed to me in a big way. It's definitely a book that will stay with me for a very long while. There are eleven stories in this book that are united by the virtue of being set on the island of Nantucket, where history moves from 1795 to the present. Another binding element is that the main characters in each and every story come to some sort of personal and yet disturbing revelations about themselves that leave the reader feeling just a bit off kilter afterwards, and this tone establishes itself in the first story and doesn't let up for a moment. It's also a book that is tinged with more than hints of sadness and despair. I won't go into each and every story, but the first tale, "Guilty Look," sets that tone in a tale about (of all things) an investigation into a bank robbery, one based on a true event. This story should end up leaving its reader with hackles raised on his/her neck as he/she realizes exactly what's happening here. My personal favorite is "Taste," the story of an ex-whaling ship captain who, when faced with death on the high seas, has done what many a sailor has done in his place. Think Philbrick's In the Heart of the Sea: The Tragedy of the Whaleship Essex or Owen Chase's firsthand account The Wreck of the Whaleship Essex, and you get the drift. Years later in 1846, this poor man still hasn't gotten over the incident, suffering from the equivalent of PTSD for years and leaving his emotional trauma to manifest itself in a very bizarre, horrific and ultimately heartbreaking way. A provoking literary collection of eleven short stories ranging from 1795 to the present all taking place on the intriguing island of Nantucket. Tethering the stories is an apparent psychological edge allowing the reader to enter the mind of the protagonists with an understanding of various epiphanies individual characters discover about themselves. Each story leaving the reader disquieted and bristled. The first five stories are historical based addressing Quaker dominance, Native American rifts A provoking literary collection of eleven short stories ranging from 1795 to the present all taking place on the intriguing island of Nantucket. Tethering the stories is an apparent psychological edge allowing the reader to enter the mind of the protagonists with an understanding of various epiphanies individual characters discover about themselves. Each story leaving the reader disquieted and bristled. The first five stories are historical based addressing Quaker dominance, Native American rifts with whites, whaling industry, and racism. The following six possess an intimate feel with topics such as depression, paranormal as well as reflection on life. Vanderslice again allows the reader entrance into the mind of the characters with privy to thoughts and feelings causing great affection. Island Fog Nantucket is an island south of Cape Cod, state of Massachusetts and this is where Island Fog takes place. A series of short stories that all take place on this island starting in 1795 to 2005. A chilling range of stories that feature believable characters, interesting plots and above all great writing. A very unique take on an island and it's people. The themes of the stories were about bigotry, jealousy, duplicity, greed, religious oppression, and murder. This is a book that you wi Island Fog Nantucket is an island south of Cape Cod, state of Massachusetts and this is where Island Fog takes place. A series of short stories that all take place on this island starting in 1795 to 2005. A chilling range of stories that feature believable characters, interesting plots and above all great writing. A very unique take on an island and it's people. The themes of the stories were about bigotry, jealousy, duplicity, greed, religious oppression, and murder. This is a book that you will want to read in one sitting if you can. Each stories just gets better overall written by an accomplished author who knows how to tell a story and definitely knows the history of Nantucket. I really enjoyed it! I've been looking for this book for months -- I keep telling everyone, I need some GOOD fiction-- something well crafted, with some heft, some gravitas, and maybe some surprise. Island Fog has all of that, and some good, dark New England history, characters, and, well, fog. This collection of stories, all set on Nantucket Island between the eighteenth and twenty-first centuries is the kind of book that makes you jealous of its author. It's one of the books you wish you'd written, or even been abl I've been looking for this book for months -- I keep telling everyone, I need some GOOD fiction-- something well crafted, with some heft, some gravitas, and maybe some surprise. Island Fog has all of that, and some good, dark New England history, characters, and, well, fog. This collection of stories, all set on Nantucket Island between the eighteenth and twenty-first centuries is the kind of book that makes you jealous of its author. It's one of the books you wish you'd written, or even been able to imagine the idea of. Each new story, each surprising plot twist, each insightfully drawn character, makes you (me) wish you (I) had even one of these stories inside of you (me). Absolutely must read -- if you can take it. I thoroughly enjoyed this collection of short stories - all engaging, some chilling, all giving a flavor of the place (consistent through the book) and the time (over a span of more than 200 years). Highly recommend. Wow! Not what I expected at all. Each short story stands alone but the location ties them together over centuries. Some of the stories haunted me... I had to finish one in daylight . 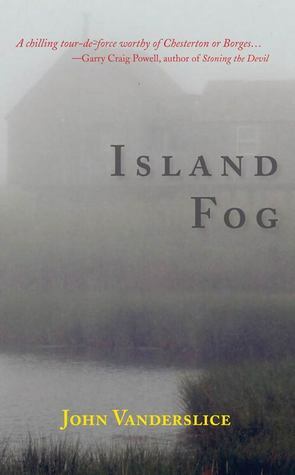 "This island feels like some mad doctor’s lab experiment”—so says one of the fictional residents of Nantucket Island, the setting of John Vanderslice’s extraordinary story collection Island Fog. But Vanderslice is by no means a mad doctor, though he is definitely one insanely talented writer. In the eleven literary experiments that comprise his book, he brilliantly parses the soul of America from 1795 to 2005 through the microcosm of Nantucket Island. To borrow the words of yet another of his characters, he conveys “the awful weight of history pressing down upon the island” and conveys it so viscerally that we feel that “time has stopped or has circled around on itself” and we are “back inside that living spiraling body, that awful protean force” that was, and is, not just the island but America. This is a book that anyone interested in the grand, failed experiment that is America should read. It will open your eyes, and your heart. John Vanderslice’s debut collection is a whopping cycle of beautifully crafted stories spanning over two hundred years of Nantucket history, each emerging from the fog of the past crystal clear, complete, and poignant. Reading Vanderslice’s stories, it’s as if Ishmael has never boarded the whaleship Pequod in Nantucket, as if he’s remained island-bound to tell these far-reaching, masterful tales. In a gripping, surreal novella reminiscent of Kafka’s The Trial, Vanderslice opens the collection in 1795, during which a consortium of religious oligarchs use a bank robbery as a kind of witch hunt to consolidate power. In “King Philip’s War,” the narrator challenges a Native American boy in a footrace whose outcome is more onerous than he can imagine. From the travails of whaling widows, to a ship’s Captain who must resort to cannibalism to survive on the high seas, to an African-American school teacher stalked by her students, we see Nantucket’s earliest European and native inhabitants struggling to find a place in this island community. In part two of the collection, beginning in 1999, Nantucket transforms from a site of colonization and industrial whaling to a tourist town, dead and haunted in its off-seasons, a crossroads for people running from others, and from themselves. A carpenter struggles with a “fog of soporific recollections” at the death of his wife and child. A man flees a love affair in Boston to establish a company giving ghost tours, only to be haunted himself. Jamaican immigrants find veiled resentment. The titular novella bookends this richly realized collection. In it, a young man flunking out of U Mass finds himself on a purgatorial visit to Nantucket, where he is hired to participate as an actor in “Hopes and Promises” tableaus that reenact customers’ past moments of deepest desires and regrets. Read this book! Rarely have I enjoyed a story collection with such artistic and historical sweep, one so quintessentially and vibrantly American. John Vanderslice's Island Fog is far more than just a collection of stories. Tied together by a place and its history, the collection tells the story of Nantucket Island through the desperate lives and conflicts, hopes and sorrows of its inhabitants. I began reading the collection assuming it was for folks who have known or loved Nantucket and by the third story I was convinced that Island Fog is for anyone who loves good stories, beautifully told, with a good slice of the twisted history of humanity thrown in. In this quirky yet captivating collection of ten stories and two novellas, all set on Nantucket, the island is both microcosm and prism, through which the reader catches illuminated glimpses of American life, from the hard, dangerous times of the whaling community to the present-day tony resort of the super-wealthy—and yet the same problems beset the inhabitants through the centuries: racism, class exploitation, sexual identity, envy and fidelity. The essence of all the fictions is “the awful weight of history pressing down upon the island”, and in a twenty-first century America struggling to reconstruct its identity, the reader cannot but hope that the idyllic and mythic island might give us a clue about who we are. And yet in the final novella, “Island Fog”, a chilling tour-de-force worthy of Chesterton or Borges, we find ourselves in a place so far from reality that, like its hapless and trapped protagonist, we wonder if we are doomed to play parts in someone else’s fantasies forever. John Vanderslice is a writer of vision and this is a haunting, essential collection. I received a digital copy of this title from the author in exchange for an honest review. A collection of stories centering around Nantucket and its residents, stretching from the 1800s to roughly today. Intrigue, manipulation and emotion are weaved through each story. I read a reasonable amount of short story collections and the thing that really stood out for me about Island Fog was the way that each story held its own as part of the group. In fact, each story felt like a nov I received a digital copy of this title from the author in exchange for an honest review. I read a reasonable amount of short story collections and the thing that really stood out for me about Island Fog was the way that each story held its own as part of the group. In fact, each story felt like a novella in itself and as I made my way through the collection, I certainly felt like I was getting some bang for my metaphorical buck. Each story focuses on a different set of characters and a different time period and so the stories read like little time capsules, transporting the reader into a particular slice of Nantucket society, before moving on to the next. On finishing each story, I definitely got the feeling that I had experienced something significant in the lives of the particular characters in that tale. The stories run the gamut from friendship dramas and finding one's place and power as a young person, to rocky relationships and the different griefs of death versus abandonment, and the magical realism of having one's hopes fulfilled at the price of accepting a twisted reality. There is definitely something here to satisfy lovers of both historical and contemporary fiction, which is a nicely unusual touch for such a collection. I suspect this collection will have particular appeal for those who live in close proximity to Nantucket, as sense of place in a narrative is always enhanced, I find, when combined with actual experience of the place. For those of us who know nothing about Nantucket save for its appearance in a very famous limerick, I suggest you give this collection a try. The author manages to evoke a certain atmosphere in the writing that gave me a very clear image of Nantucket as a place that had more going on than would appear at first glance. where to begin. First this book is amazing. John Vanderslice has created stories that have the musings of Hitchcock and even in some instances Twilight Zone while giving the stylistic writing of Edgar Allen Poe. Very chilling and very engaging. How can I say the musing of Hitchcock and Twilight Zone well some of the stories will remind you of movies and shows of Hitchocks and others have that feel of the twilight zone where you feel you have been brought somewhere alternative in nature. this is particularly true of the last story Island fog. that one was just really really intriguing but made you feel like you were in a new world while everyone else was somewhere else. Like Poe's stories there is a theme and a reason behind the madness or even lesson to be learned. Also like Poe you are drawn in and left dangling until they feel the time is right to take you off the hook and reveal the real meaning behind everything in chilling detail sometimes. Vanderslice only reveals things when it is necessary and when it is desired. He draws you in keeps up the creep factor (Haunted and Taste are in this area for sure) has you on the edge and slowly ever so slowly reveals the tale. Whether it be about a lover who haunts you, the idea of finding your humanity and how far people will go to carry out illusions and desires, the desire to start over or to show lessons that needed to be learned by others it is entailed in these stories. All take place in Nantucket or around there and span decades even centuries. Each unique in what they are teaching you and entertaining you with and yet intertwined in one way or another. Island Fog by John Vanderslice is an intriguing and dark collection of eleven short stories and since I enjoy the darker side of things I enjoyed it. The stories of Island Fog are linked together by the setting of Nantucket Island and the theme of the stories themselves and they range from 1795 to 2005 so the historical aspect of this collection is especially interesting. Island Fog is a novel to savor slowly – pick it up, read a story, and then reflect on it before indulging in the next one. The dark tone has made many of these stories hard to forget. The first five stories are historical in nature. They deal with the Quakers, Native Americans, racism and more. The following six stories focus more on the island and its inhabitants. I really enjoyed these stories and the disturbing quality to some of them. Of course I liked some of the stories more than others but a few personal favorites were On Cherry Street which is about a woman who decides she may not be as distressed about being a widow as she should be. Another was Taste which is a very twisted story and that’s all I can say about it without giving away something important about it. Needless to say it is still foremost in my mind. The last I’ll share as a favorite was called Island Fog. This one combines magical realism and illusion with what one perceives as their true desires and just what they’ll give up to achieve them. Yet another story that has stayed in my thoughts. John Vanderslice definitely has an exquisite way with words, thoughts, and feelings. Even in a short story he manages to draw you fully into the story and the characters portrayed in it. As much as these stories are centered on Nantucket Island they are also about people and the things that drive us in our lives. From early whalers and their widows, Quakers, Congregationlists, and Native Americans to a widowed plumber, an expectant father, and more, Vanderslice offers up snapshots of life through the eyes of a variety of John Vanderslice's collection features eleven tales centered around the island of Nantucket and the people who live there. The first half are historical, the rest are set present day (more or less) and all of them excel in giving the reader a strong sense of the island and its residents. Island Fog is a collection of short stories that take place on the island of Nantucket off Massachusetts. The stories are written in chronological order. This allows the reader to follow the historical social and economic developments of Nantucket, which are, of course, also applicable to the American population in general. As a lover of all things historical, I found this approach interesting even though not every story was easy to read. The first story, for example, features religious bigotry. Island Fog is a collection of short stories that take place on the island of Nantucket off Massachusetts. The stories are written in chronological order. This allows the reader to follow the historical social and economic developments of Nantucket, which are, of course, also applicable to the American population in general. As a lover of all things historical, I found this approach interesting even though not every story was easy to read. The first story, for example, features religious bigotry. I found this emotionally difficult to read as I´m currently living in a region of the world that is on the knife´s edge of religious extremity. Vanderslice is a gifted writer. His prose is beautiful. I sometimes found myself rereading passages just to enjoy the beauty of the words he has managed to elicit when putting pen to paper. Although many of the stories are very short, he still manages to create characters that develop and change with the telling of the tale. I especially enjoyed the element of supernatural that was sparsely sprinkled into the mix of stories. My only criticism of the collection is the final story. As a lawyer, I couldn´t enjoy the tale as much as I would have liked due to the inaccuracy of the legal elements contained therein. A series of short stories around Nantuckett island. The stories are told over two hundred years starting in 1795. The style of writing reminds of John Steinbeck and Conan Doyle, very unique and keeps the reader totally enrapt. As you follow the series the descriptive narrative paints an excellent image, the nostalgia involved in some of the tales reminds me of my childhood and as we move through the years, the changes in society and the movement of people it is very poignant. The novelist always A series of short stories around Nantuckett island. The stories are told over two hundred years starting in 1795. The style of writing reminds of John Steinbeck and Conan Doyle, very unique and keeps the reader totally enrapt. As you follow the series the descriptive narrative paints an excellent image, the nostalgia involved in some of the tales reminds me of my childhood and as we move through the years, the changes in society and the movement of people it is very poignant. The novelist always leaves a twist to the end of the tale which provokes thought and let's you decide the possible outcome. The interesting thing I found about this book is as we move through the ages people and their thoughts and morals stay the same even if everything else is changing around them. The historic and geographically knowledge and research the author has put into their writing has to be commended. Interesting tales, descriptive characters, excellent places, makes an intriguing and thought provoking read done in a new and refreshing style, which I hope will lead to more stories. If you like good solid tales built around an interesting place with plenty to think and ponder about this is the author for you. Island Fog by John Vanderslice is a collection of short stories set in Nantucket Island, Massachusetts spanning through the decades of 1795 to more present 2005. A collection of short stories, set in within a historical fiction setting with the first half of the book. With historical fiction the setting is the most important literary element. The reason for this is because the author is writing about a particular time in history so the information that he is writing about must be accurate, authe Island Fog by John Vanderslice is a collection of short stories set in Nantucket Island, Massachusetts spanning through the decades of 1795 to more present 2005. A collection of short stories, set in within a historical fiction setting with the first half of the book. With historical fiction the setting is the most important literary element. The reason for this is because the author is writing about a particular time in history so the information that he is writing about must be accurate, authentic or both. The time period must be thoroughly researched create a authentic and accurate setting in the book. The author must get the idea, the feeling, learn how the people ate, what kinds of homes they had and artifacts that are common. John Vanderslice has done just that. He portrays "the awful weight of history pressing down upon the island" with the feeling that "time has stopped or has circled around on itself”. I really enjoyed this book! (Disclosure: The author is a creative writing prof in my MFA program and a friend.) I loved the idea of the stories all taking place on Nantucket, but this isn't a novel in stories; there are no linking characters except the island itself. The stories are all really different from each other, and yet all are fully realized and imagined, the characters very real, the conflicts and epiphanies relatable and compelling. I also enjoyed how Vanderslice separates the stories I really enjoyed this book! (Disclosure: The author is a creative writing prof in my MFA program and a friend.) I loved the idea of the stories all taking place on Nantucket, but this isn't a novel in stories; there are no linking characters except the island itself. The stories are all really different from each other, and yet all are fully realized and imagined, the characters very real, the conflicts and epiphanies relatable and compelling. I also enjoyed how Vanderslice separates the stories into two sections, long past and contemporary. I struggled to get into this book, but once I did my patience was rewarded. The stories are beautifully crafted, making use of language which at times borders on baroque. The way in which John Vanderslice links his separate stories is masterful, with echoes of Melville. Possibly because I was suffering from a nasty head-cold while reading Island Fog, the tales (to me) felt surreal and misty - not that this detracts from the pleasure, far from it. Maybe one to re-read when healthy! *Goodreads Firs I struggled to get into this book, but once I did my patience was rewarded. The stories are beautifully crafted, making use of language which at times borders on baroque. The way in which John Vanderslice links his separate stories is masterful, with echoes of Melville. Possibly because I was suffering from a nasty head-cold while reading Island Fog, the tales (to me) felt surreal and misty - not that this detracts from the pleasure, far from it. Maybe one to re-read when healthy! Vanderslice has written an engrossing collection of stories that spans a little over 200 years. Set in Nantucket, the tales cover the darker side of the beautiful little island and its inhabitants. Bigotry, jealousy, betrayal, greed, religious indifference, and murder are just a few of the topics covered in this evocative novel. The chronological order in which this is written makes it a bitter reminder that mankind has advanced in many ways, but there are some things that will never change. Beli Vanderslice has written an engrossing collection of stories that spans a little over 200 years. Set in Nantucket, the tales cover the darker side of the beautiful little island and its inhabitants. Bigotry, jealousy, betrayal, greed, religious indifference, and murder are just a few of the topics covered in this evocative novel. The chronological order in which this is written makes it a bitter reminder that mankind has advanced in many ways, but there are some things that will never change. Believable, entertaining, and quite haunting is my best description. Great read! This is a group of stories and each one made me wonder. This is also the best time of year to read this book, just before Halloween. I usually read a story at a time, but these stories were woven together by their setting and I was pulled in to the isand and was curious what would happen next. It was hard for me to put this book down. I also really liked that the author had the stories advance through time. It was interesting to read how the people and times can move on, but the island never los This is a group of stories and each one made me wonder. This is also the best time of year to read this book, just before Halloween. I usually read a story at a time, but these stories were woven together by their setting and I was pulled in to the isand and was curious what would happen next. It was hard for me to put this book down. I also really liked that the author had the stories advance through time. It was interesting to read how the people and times can move on, but the island never lost itself. I am giving this book a 5/5. I was given a copy to review from the author, however all opinions are my own. I really enjoyed all the stories in this book except for the last one, which felt like it was from a different collection altogether. I think the first one was my favorite. An interesting blend of short stories, I enjoyed visiting Nantucket through different centuries and enjoyed the historical aspect of the book. With each story, I became more and more engrossed in the landscape and the diverse characters and plots. Fantastic writing! John Vanderslice hails from southern Maryland, specifically the eccentric community of Moyaone, which was developed in the 1950sand 60s by a fearless crew of overeducated, wannabe hippies and anti-social survivalists escaping from Washington DC and its ruthlessly expanding white collar suburbs. After twelve years of Catholic schooling, and too many summers working as a lifeguard, he left the south John Vanderslice hails from southern Maryland, specifically the eccentric community of Moyaone, which was developed in the 1950sand 60s by a fearless crew of overeducated, wannabe hippies and anti-social survivalists escaping from Washington DC and its ruthlessly expanding white collar suburbs. After twelve years of Catholic schooling, and too many summers working as a lifeguard, he left the southern Maryland woods to attend the University of Virginia, from which he graduated in 1983. A series of silly jobs, and a flurry of different addresses, in the Washington DC metro area finally led to him entering the MFA in Poetry Writing program at George Mason University in 1986, where he studied under Peter Klappert, William Matthews, and Susan Tichy. He graduated in 1991 and started teaching writing to college freshmen at GMU and Northern Virginia Community College-Annandale. In 1993, he entered the Ph.D program in the English Department at the University of Louisisana-Lafayette, located at the epicenter of the Cajun cultural world. After four years of fine dining, great music, and inspired literary fellowship he moved to Conway, Arkansas, where he began teaching part-time at the University of Central Arkansas while acting as a stay-at-home dad for his infant son. Several years and another son later, he is a Professor of Creative Writing in UCA's new Department of Film, Theatre, and Creative Writing. There he teaches fiction writing--and occasionally other genres--both to undergraduate majors and to graduate students in the Arkansas Writers MFA Workshop. His household is comprised of his wife Stephanie, his two sons, five cats, and two dogs, including the baby of the family, Asuna. More than seventy of his stories, poems, essays, and one-act plays have appeared in literary journals and anthologies. A partial list of these journals includes Seattle Review, Versal, Sou’wester, Laurel Review, Crazyhorse, The Pinch, Southern Humanities Review, 1966, Squalorly, Foliate Oak, Red Wheelbarrow, and Exquisite Corpse. Some of the anthologies are Appalachian Voice, Redacted Story, Chick for a Day, The Best of the First Line: Editors’ Picks 2002-2006, and Tartts: Incisive Fiction from Emerging Writers. He also maintains the blog Payperazzi (http://payperazzi.blogspot.com), in which he writes about the writing life and the teaching writing life. You can employ the following links to find some of his works published in online journals.